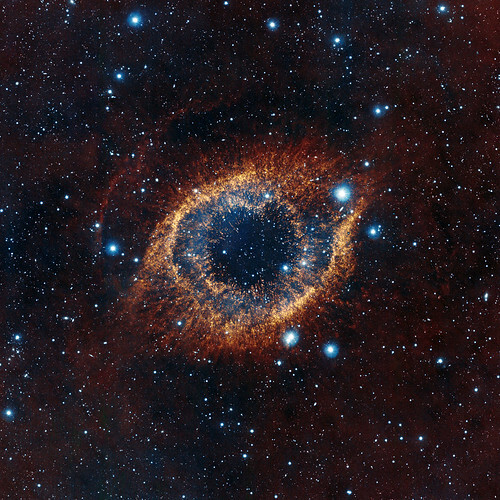 The Helix Nebula in New Light… Again! The Helix Nebula is an iconic astronomical object – it’s been imaged again and again, by a variety of satellites. It’s one of those objects that gets turned into desktop wallpapers, posters, and postcards. It was even featured on a postage stamp issued in Great Britain in 2007. 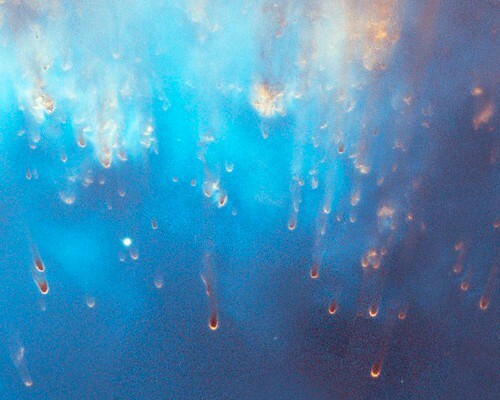 It’s one of those inspiring, mysterious images of space that people like to look at. And guess what – scientists like to look at it too! The image above combines observations of the Helix from the the Advanced Camera for Surveys aboard the Hubble Space Telescope and the ground-based Cerro Tololo Inter-American Observatory in Chile (you can download it from HubbleSite). There are many similar images of the Helix in visible light, and others across a variety of wavelengths. Many satellites and ground-based observatories have turned their eyes towards the Helix Nebula. A new image of the Helix was recently released by the ESO’s Visible and Infrared Survey Telescope for Astronomy (VISTA). Unlike the first image, this one shows the Helix through infrared filters. The video below zooms in on the location of the Helix, and shows a comparison of visible and infrared images. Okay, so it makes the Helix look even more like the Eye of Sauron. But… who cares? Why do astronomers look at the same objects, again and again? To answer these questions, I turned to my colleague (and officemate) Sarah Eyermann, who studied the Helix as part of her graduate research in astronomy. Sara: Let’s start with the basics. 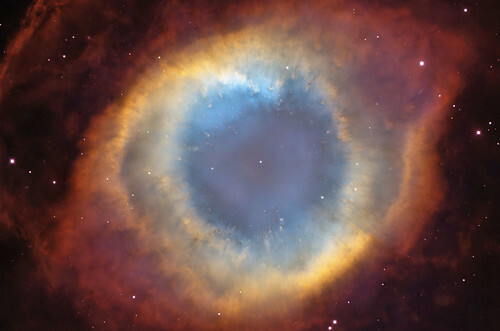 What is the Helix Nebula? Sarah: It’s a very pretty planetary nebula that has been imaged a number of times. A planetary nebula has nothing to do with planets (that’s a historical name) – it’s actually the final stage of evolution for intermediate-mass stars (like our Sun). After a star has gone through its life, it sheds its outer layers of material, and it’s still hot enough to ionize that gas as it drifts off into space. That’s why you see that ring-like shape in many planetary nebulae. Sara: Why do so many people study the Helix? Why do so many telescopes and satellites look at it? Sarah: It’s one of the most easily observable planetary nebulae, because it’s one of the closest to Earth (about 700 light-years away, visible in the constellation Aquarius). We think it’s a decent representative of the shape and structure of planetary nebulae in general. Sara: What did you study about the Helix? Sarah: The research that I participated in with my advisor, Dr. Angela Speck (which has progressed much further in the years since I left University of Missouri), was looking specifically at the inner rim of the Helix’s gas ring. In the image above, you can see interesting knot-like filaments. If we look at an image of the Helix Nebula in infrared light, we can look past the dust that is opaque in visible light, and see pockets of molecular hydrogen that correspond to these knots. Since we would expect all of the gas at that point to be ionized by the heat of the star, it was an interesting phenomenon to study. We wanted to know more about these clumps, and how they changed with the age of the planetary nebula. We chose a number of nebulae of different ages, with the intention of comparing the visible and infrared images for all of them. 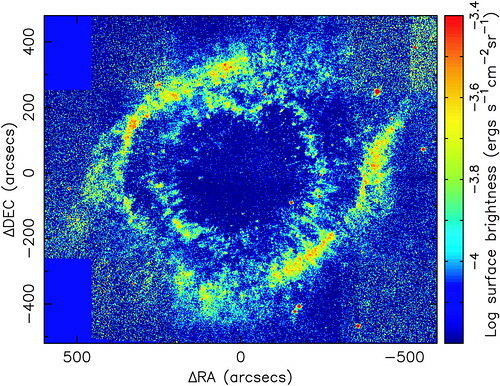 The image above, of the Helix in a specific band of the infrared, was one of the images that I used in my research. In many ways, it’s actually very similar to that new VISTA image! Planetary nebulae help distribute many elements back to the interstellar medium (the gas and dust that exists between stars). Understanding the structure of planetary nebulae can help us understand the distribution of the gas and dust that eventually is used not only in star formation, but in the formation of solar systems such as ours. Undoubtedly, we will see many more beautiful images of the Helix Nebula as scientists and amateur astronomers alike keep looking at it – a search on HubbleSite alone provides a wealth of existing visible light imagery (focusing on specific features as well as the entire object). Each time a new satellite or telescope turns its optics towards the Helix, and each time we observe it in another wavelength or through a different filter, we’re revealing more about its structure and features to better understand planetary nebulae and how the universe works. hi sara! i particularly appreciate the log surface distribution image. can you post more graphical representations? chinmaya – That’s the only one that we’ve got like that for that research, but we’re always trying to give people a look at the real data and analysis that scientists are doing! Pictures are really impressive !